Karlotta Washington of MarkSQuared Studios near Clarkston closed on a Start:ME loan this summer to build out her multipurpose creative studio space. Now through Nov. 14, the Start:Micro-Entrepreneur Accelerator Program (Start:ME) will recruit promising entrepreneurs in and around Clarkston and East Lake for its 2017 programs. Fifteen to 20 entrepreneurs in each community will be chosen to participate and qualify for up to $60,000 in small business loans. Start:ME is a free 14-week accelerator program that provides entrepreneurs in marginalized metro Atlanta communities the business acumen, mentorship support and early-stage financing needed to develop their businesses. Both communities offer peer-selected, low-cost loan pools of $30,000 to invest in up-and-coming businesses. The program is developed and delivered by Emory’s Social Enterprise @ Goizueta (SE@G) in partnership with Access to Capital for Entrepreneurs, the East Lake Foundation and Friends of Refugees. 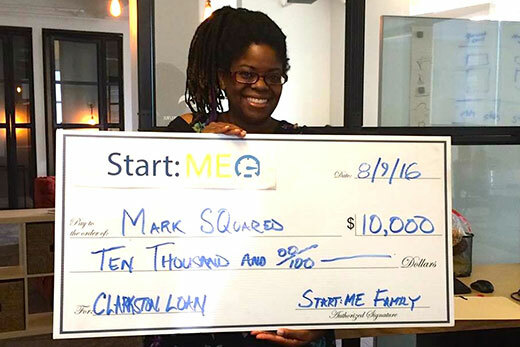 Start:ME made $50,000 in loans to small businesses in the Clarkston and East Lake communities this summer. Since its inception in 2013, Start:ME has supported 84 local business ventures and made 15 working capital loans. Participants have attracted $233,000 in investment capital, established seven new brick and mortar locations, and created 28 new jobs. Social Enterprise @ Goizueta (SE@G), a research center within Emory’s Goizueta Business School, stimulates innovative market-based approaches to generate positive societal impacts in places where markets are currently ineffective. Faculty, staff and students work with for-profit, non-profit and hybrid organizations to inject business thinking into communities through research, fieldwork and teaching/student activities. The Start:ME program runs from January through April and is free to participants. The program works across all industries and skill sets — mechanics, artists/makers, bakers/caterers, farmers, tutors and more — and focuses on entrepreneurs with promise and dedication. The program’s goal is to help entrepreneurs achieve business success and build neighborhood vitality. The Clarkston program has graduated 53 ventures since 2013. The East Lake program has graduated 31 ventures since 2015. Karlotta Washington of MarkSQuared Studios near Clarkston closed on a loan this summer to build out her multipurpose creative studio space. “The Start:ME program helped take my business to the next level in terms of my skills, business network and future vision. This loan allows me to scale my business and build my business credit," Washington says. Scott-Madison Studio, an East Lake full-service makeup and photography studio founded by Sailauna Scott-Madison, is using loan funds to purchase state of the art travel equipment, training and certifications to meet increased demand for events and photo shoots. Applications are open through Nov. 14 for the 2017 program. Upcoming information sessions include 6-8 p.m. Thursday, Nov. 3, at Clarkston First Baptist Church and 4-6 p.m. Thursday, Nov. 10, at Toomer Elementary School in East Lake. Start:ME also engages more than 50 volunteer mentors with significant professional business and/or entrepreneurial experience to provide critical support for entrepreneurs participating in the program. Start:ME welcomes applications from interested business professionals. Other local partners include PNC Bank, the presenting sponsor for the East Lake program; Drew Charter School, Villages of East Lake, East Lake Neighborhood Community Association, Kirkwood Neighbors’ Organization, Clarkston Community Center and Partnership for Community Action. Visit startmeaccelerator.org for more information, to RSVP for information sessions, to complete a Start:ME application, or to apply to be a mentor.